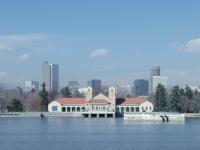 This is a slide-show type screensaver featuring approximately 60 original photographs by Bruce Quackenbush of Denver City Park. Photographs are displayed full-screen in random order and cycle approximately every 10 seconds. There is a smooth fade-in/-out transition between each photograph in the set. 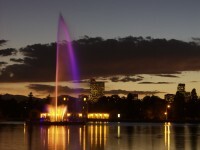 Denver City Park, with over 100 years of history, is home to the Prismatic Electric Fountain in Ferril Lake, the Thatcher Memorial Fountain, the historic Boathouse and pavillion, and the Denver Museum of Nature and Science. 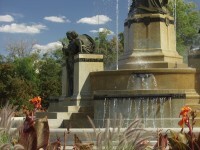 Both fountains were restored or, in the case of the Electric Fountain, completely re-built in the summer of 2008 in time for the return of the Democratic National Convention to Denver. The free version of this screensaver contains a few slides with a "Purchase this screensaver..." reminder. There's no "tryout" period, no disabled features, and no crippling nag screens. My hope is that you'll enjoy the software enough that it will be worth $15.00 to you. The registered version is free of distracting purchase reminders. 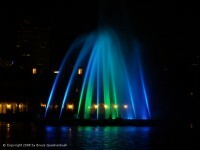 When you click the download link below you will be prompted to Open or Save the file city_park_2008_unreg_install.zip. This is a compressed (zipped) folder 6.30MB in size. You can Open it directly, or choose Save and select a temporary folder on your computer. The ZIP file contains the executable installer program, double-click to run. Then just follow the prompts. This software is provided as-is and without warranty other than to be free of viral or malicious content. 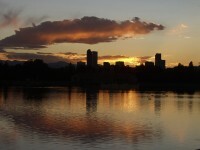 It is not to be copied or re-distributed without express written consent from Bruce Quackenbush. All images contained in these screensavers are protected by federal and international copyright laws.